Unfortunately ‘Blueberry’ doesn’t get much use these days. (I suppose it doesn’t help that I have it sitting next to my gaming box..) With that in mind, and being excited to attempt another microsoldering project I went ahead with the proceedure. I initially went for a 100Mhz overclock (which didn’t work) and when that failed, I dropped back to a 50Mhz overclock. The second attempt worked, but it wasn’t without difficulty. While removing the 3 resistors I nearly lost 2 of them due to them suddenly snapping out of the electronics tweezers I was holding them with. To give you an idea of just how small these things are, take a look at picture below. 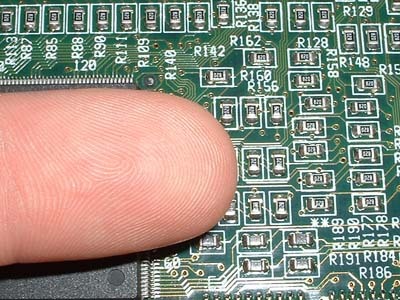 This is my index finger next to some surface mount resistors on an old video card. These are about 3 times larger than what I was dealing with on the iMac system board. Yea, they’re really small. Once I got all the resistors back in their places, and everything tested ok, I decided to call it quits for the day. It occurred to me that the layout of these resistors, and the relatively low values of them would make it possible to replace them at some point with a jumper block similar to that on the Yosemite G3’s making this process much easier. (perhaps another day) Another idea I had, which was inspired by this site, was that I might be able to adjust the voltage to the CPU to make it accept a higher overclock. This would definately be more involved requiring metal cutting tools (for fitting larger cooling hardware into the tiny case) and serious modifications to the case, and possibly the power supply. That mod is going to take some careful research and planning if I’m going to pull it off. 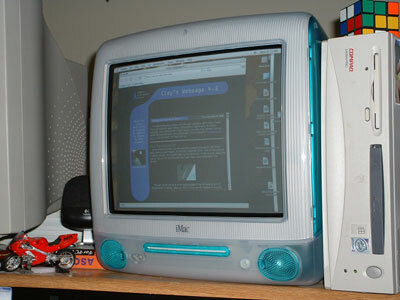 For now though, I’m happy with my mac as is. The conversion from the stock 400Mhz to 450Mhz wasn’t particularly difficult in concept. You basically just open the case and move 3 resistors, and bang.. you’ve got 50 million free cycles to add to your CPU per-sec. The real difficulty is the extremely small size of the components. This means you need very good soldering skills and a steady hand, or you will break your mac! I say this as a warning to any casual modders and overclockers out there. While a 50Mhz increase on a 400Mhz CPU is decent, it’s not that big of a difference. However, it is enough to notice in application performance. Basically this mod doesn’t add much (I couldn’t tell a difference) extra heat to the system, but it doesn’t give you an amazing performance increase either. If I decide to try to volt-mod the board in the future I’ll be sure to write about it here. For now, I’d say this mod is more trouble than it’s worth to the average modder. Overall, the iMac overclocking mod hasn’t done a whole lot to get me to use it more. The recent addition of more system memory has improved it a lot. The one remaining problem with it didn’t show itself until I decided to get the iMac folding. This will require some explanation to those who haven’t heard about the project. I try to help out the Folding @ Home project at Stanford by putting 4 or 5 of my machines to work running their distributed computing client. The project studies the properties of protein folding in the hopes of better understanding the inner workings of our biological building blocks. In any case, the high CPU load of the FAH client combined with the extra heat output of the overclocked CPU resulted in rather nasty system crash.